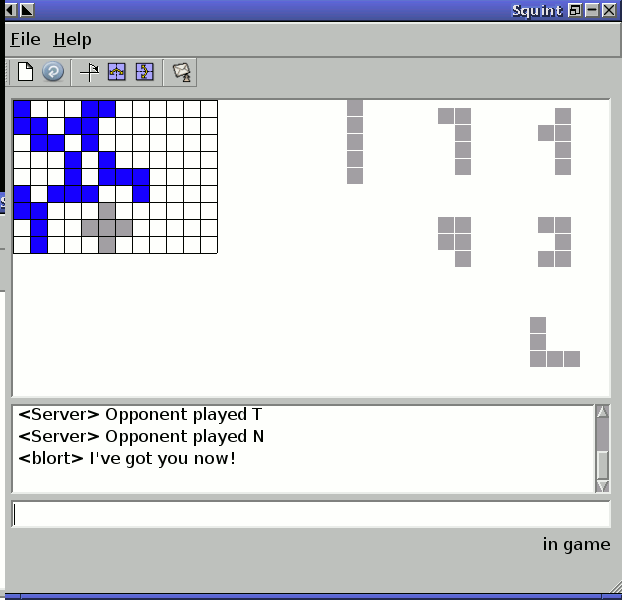 This is Squint, a two-player board game supporting Internet play. The original board game is from Kadon Enterprises. Players take turns placing pentominos on the board. The initial piece must cover a corner square. Subsequent plays must touch at least one other pentomino at a corner; they cannot overlap other pentominos or touch them at edges. The last player to place a piece wins. You should have received a copy of the GNU General Public License along with this program; if not, write to the Free Software Foundation, Inc., 51 Franklin St - Fifth Floor, Boston, MA 02110, USA. The server listens on port 10648. I hope to one day provide a public server.